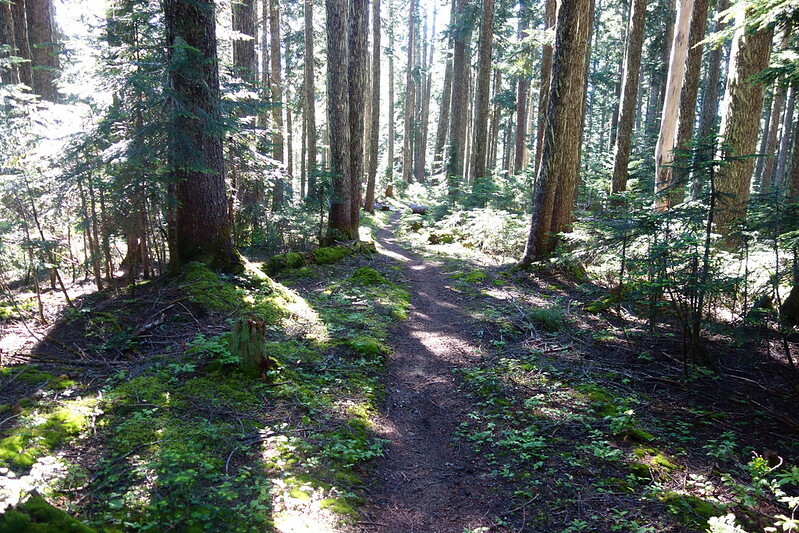 WA PCT, Day 10: Speaking for Trees – Hi, Alpine. I woke up feeling really good this morning, ready to walk, quickly packed up camp, and sped pleasantly through the deep old forest at the northern edge of the Norse Peak Wilderness. 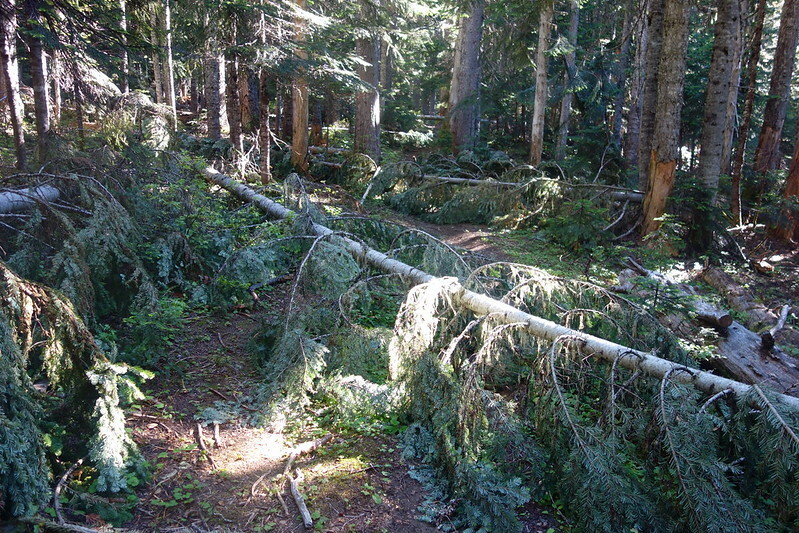 There were thick stretches of blowdowns, but somehow it didn’t bother me. 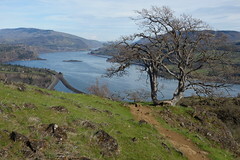 I thought of Bell Creek, or of some of the other lesser traveled trails in the upper Columbia Gorge. It reminded me of home. How wonderful to live the sort of life where old growth reminds one of home. I’m stopped for breakfast just past the Norse Peak boundary, at an old ski cabin on the edge of Government Meadows. The cabin itself is hot and buggy and smells like a thousand campfires, but the open woods behind are lovely, and I’ve been sitting for half an hour, watching elk play in the meadow. A couple of minutes ago, I was joined by a couple thru-hikers, and we’ve been chatting happily about gear, and about their unhappy discovery that duct tape is, in fact, flammable. 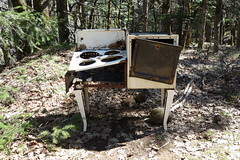 After the cabin, the scenery suddenly changed, from deep forest to land deeply scared by countless clear cuts, bulldozed paths and broken trees, and the tangled remains of a fire accidentally set by loggers in the late 80s. I hate this. 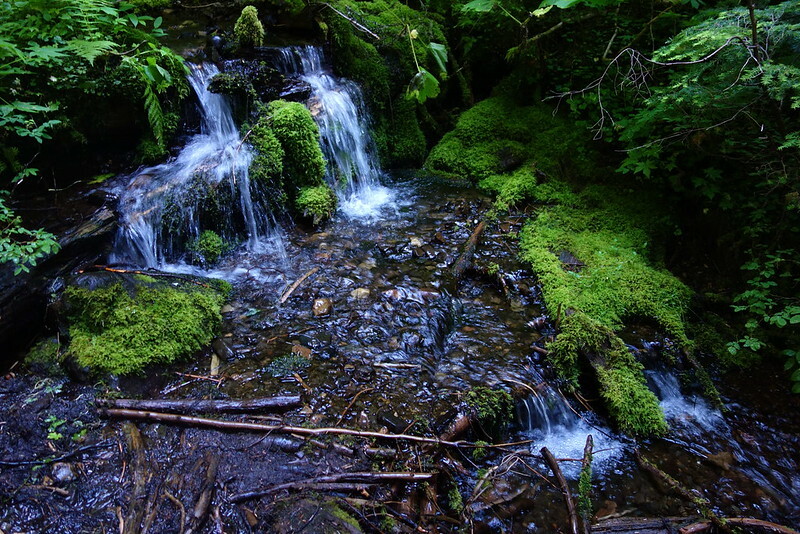 I’m stopped for lunch at a small spring on the side of a dusty logging road, the last water for 11 or 12 miles. 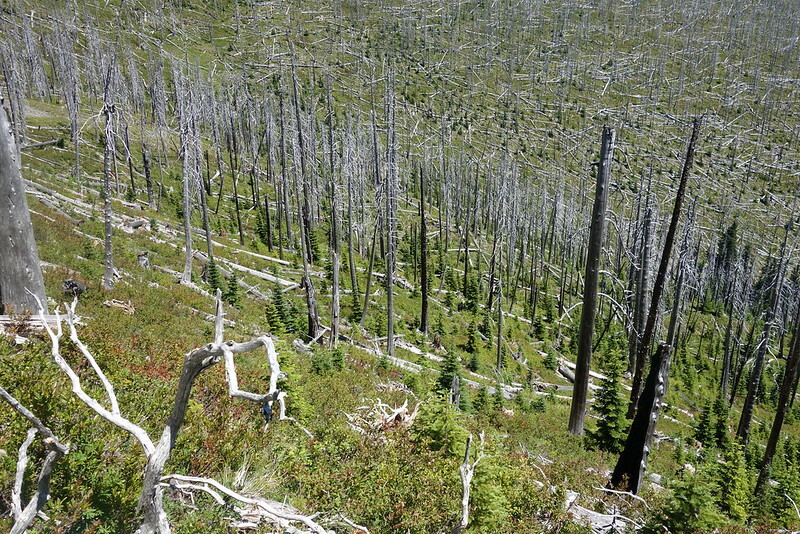 Before walking through all of this, I didn’t realize the extent to which this sort of logging transforms entire ecosystems. 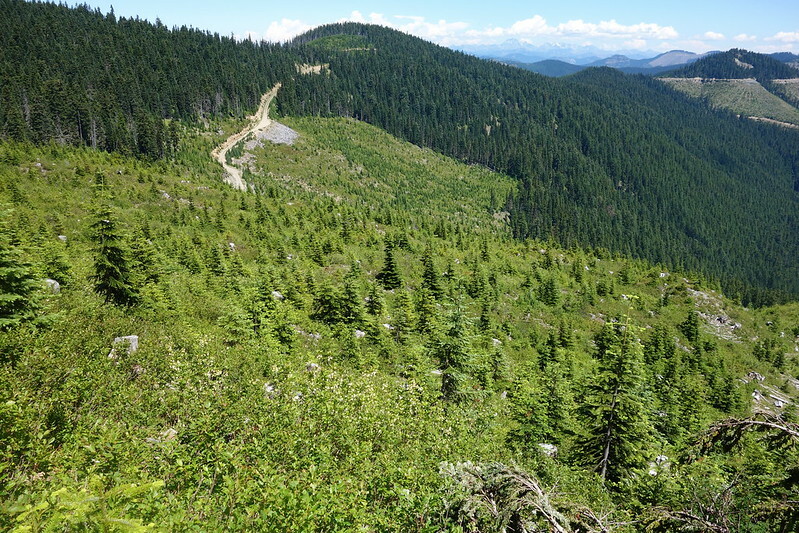 It’s not just the obvious lack of trees, but also the less obvious impoverishments of soil, and the long-term changes it causes to the whole wilderness. 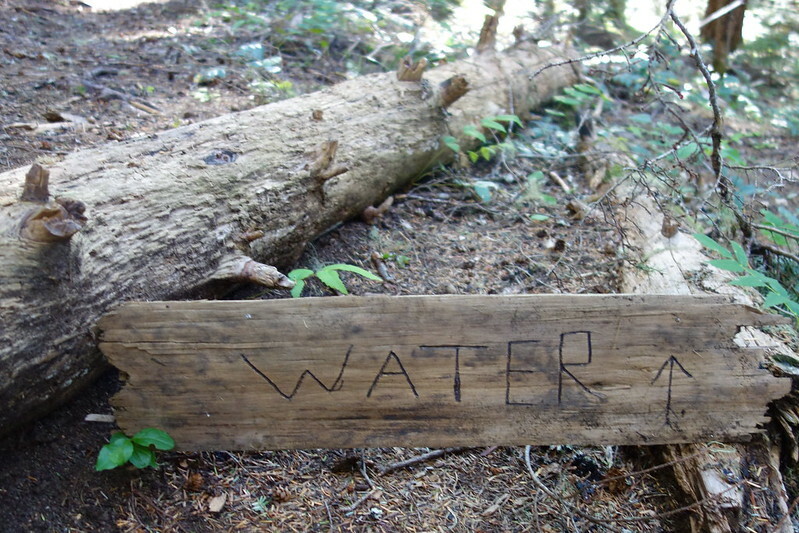 The voice of the inanimate object, therefore, should not be stilled… Before these priceless bits of Americana (such as a valley, an alpine meadow, a river, or a lake) are forever lost or are so transformed as to be reduced to the eventual rubble of our urban environment, the voice of the existing beneficiaries of these environmental wonders should be heard. But I guess we’ve never been great at hearing quiet voices, and so we get this instead. For miles after the spring, the trail climbed in and out of clear cuts, along dusty roads, and through precious scraps of forest, left intact by the checkerboard pattern of property ownership in this part of the Cascades, a remnant of some ancient deal between the Federal Government, the railroads, and timber companies. I’m not categorically against logging, but walking through the absolute hell we’ve made, I can’t help but think there must be a better way. There must be a way we can live without doing this to the world. There has to be. 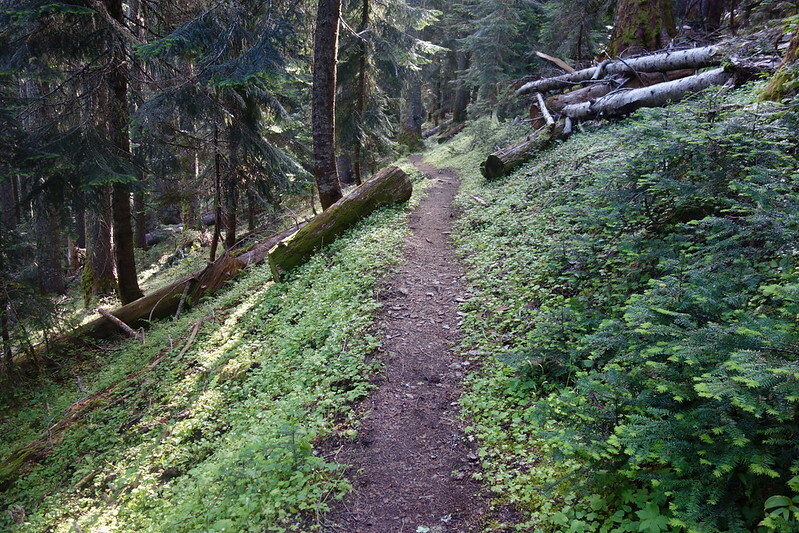 After a steep climb to Blowdown Mountain, the clear cuts relented, and the trail began a long, gentle, wooded descent through pretty second-growth forest down to Tacoma Pass. 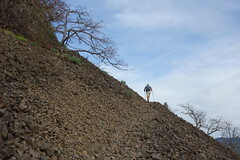 But instead it was a short walk further, down to a stomped down flat next to Road 52. It’s not exactly pretty, but there are trees here, and berries. I ate dinner at the base of a big old fir, leaning hard against the trunk, staring up at the miraculous green canopy, getting teary eyed.